Select the link above for more information, or the quick links below. 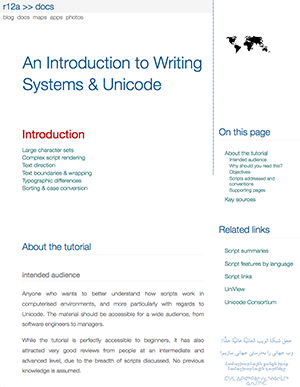 For anyone who wants to better understand how scripts work in computerised environments, and more particularly with regards to Unicode. 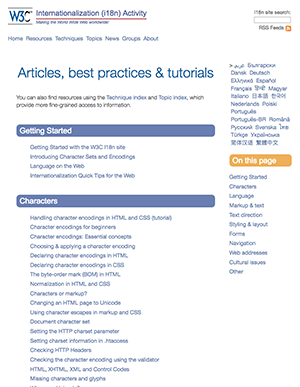 The material should be accessible for a wide audience, from developers to managers, and comes with a set of interactive pages that explore the examples and scripts in the tutorial. 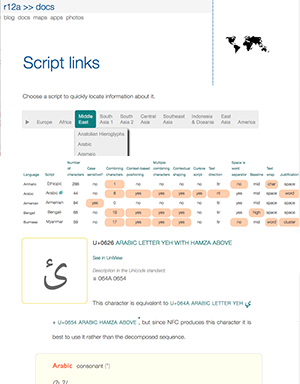 Translations in various scripts of phrases that can be used for examples in documents and presentations. 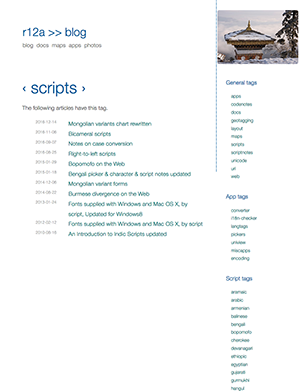 A list of fonts packaged with the Windows7/8 and Mac OS X SnowLeopard/Lion operating systems, grouped by script. 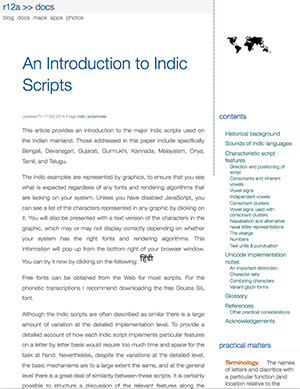 An introduction to the major Indic scripts used on the Indian mainland. Those addressed in this paper include specifically Bengali, Devanagari, Gujarati, Gurmukhi, Kannada, Malayalam, Oriya, Tamil, and Telugu. 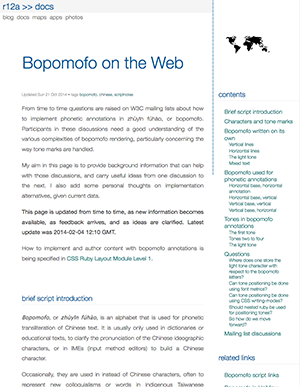 From time to time questions are raised on W3C mailing lists about how to implement phonetic annotations in zhùyīn fúhào, or bopomofo. Participants in these discussions need a good understanding of the various complexities of bopomofo rendering, particularly concerning the way tone marks are handled. 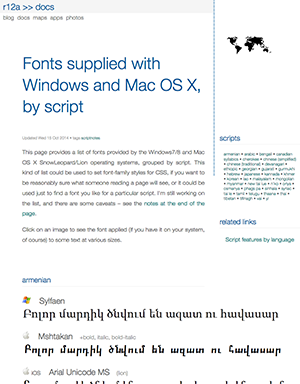 There is some confusion about which shapes fonts should produce for Mongolian characters when combined with Free Variation Selectors (FVS), and sometimes also when not. 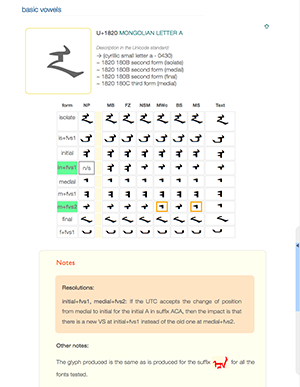 This document looks at what glyphs are produced by fonts for characters in the Mongolian block, and tracks ongoing discussion about how to standardise them. 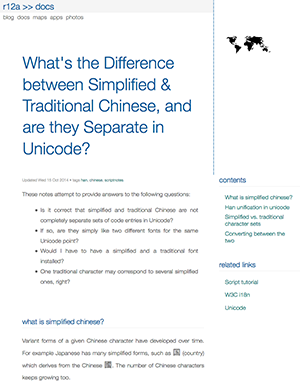 What's the Difference between Simplified & Traditional Chinese, and are they Separate in Unicode? Blog posts that touch on script related topics. A range of articles, mostly about international features of HTML and CSS, on the W3C site. 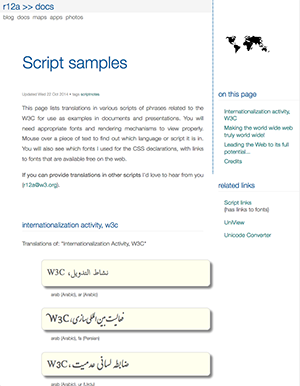 Blog posts that touch on web internationalisation. Last update 2019-03-28 19:19 GMT. • Copyright r12a@w3.org. Licence CC-By.